Now that the market is being flooded with such a confusing profusion of different lamps to replace the incandescent bulb, it is more difficult than ever to find the right lamp for the right place. • In closed luminaires it is not advisable to use CFLs as they get too hot which shortens their life. Where you have very short burning time, such as in a closet or the bathroom, the lamp life will shorten significantly if you turn it on and off a lot. In such a situation you could preferably choose a halogen lamp. • If temperatures are too low [= outdoors in northern winters] the [CFL] lamp does not perform at its best. The lamp is made to function best in 25 degrees [C]. In such a situation we think the best option is to use an induction lamp. Very expensive but on the other hand it lasts 100 000 hours. • When you get older, 60+, you need more light to be able to see, and our ability to distinguish colours and contrasts diminishes. Then we need to choose a light that solves all three problems. • When it comes to contrast, for example, it is usually limited to reading text, black on white. Then you need to choose a CFL with higher effect, e.g. 15W and you can use a correlated colour temperature around 4000K, but only for reading. • When in a situation where colour rendition is very important, where you need to match colours, then it is very important to use a mains voltage halogen lamp because it has much better colour rendering capacity. It can be a situation like cooking, where all colours seem matte to the eyes. So what an elderly person perceives as ‘brown’ may actually be burnt. With halogen you see better. • CFLs are not the answer to all our prayers. When it comes to colour rendering they are not as good, and they also contain mercury. LEDs will be the dominating technique, but it’s better to replace low voltage spotlights with LED spotlights than replacing standard bulbs for general lighting. My comments: Good advice all of it, except for the recommendation to use cool-white CFL for reading. I would instead recommend frosted incandescent or halogen for reading, as clear bulbs tend to give disturbing light patterns on the page and most LEDs are either too dim or too directional. Unfortunately, thanks to the European Commission, that’s no longer an option. • For those who prefer a daylight-simulating light, despite the lower contrast, white LEDs are naturally cool-white already and need no special phosphor mix like CFLs to achieve a daylight look. But daylight lamps usually look best in the daytime. At night the cold light can look and feel more unnatural when contrasted against the dark as we humans are traditionally used to firelight at night (though cultural and individual preferences may vary). • Where warm-white incandescent type light with perfect colour rendering is needed, there exists no replacement other than halogen (which is also incandescent). No CFL or LED has that special sunny feel and warm glow which makes colours come alive. • In traditional environments with antique furniture and art, CFLs and LEDs tend to look particularly out of place, whereas they may look acceptable with more contemporary designs, even if a bit dull. • When it comes to mood lighting of your dinner table, cosy corner or favorite restaurant, CFL and LED have zero romance factor whereas the warm light of halogen or incandescent spots on dimmers will complement candle light and create an attractive, romantic and relaxing atmosphere. In rooms where you’re mostly sitting down and relaxing (like the living room), use many low-watt (7, 15 or 25 watt if incandescent) lamps placed low around the room, e.g. on walls, tables or in windows, rather than one bright ceiling light. Can be complemented with floor reading lamps and ceiling floodlights to be turned on when needed. Avoid up-lighters and torchieres. • Around children, I’d use only warm-white LED lamps (which are cool to the touch) or low watt frosted incandescent bulsb in enclosed & shaded luminaires. CFLs contain mercury and can break and should therefore never be used around children or pets. Clear halogen lamps can get too hot, bright and glaring. One exception is IKEAs Snöig series of desk–, wall– and floor luminaires where the halogen lamp is well protected from curious fingers and eyes. • For night-lights, I recommend LED. 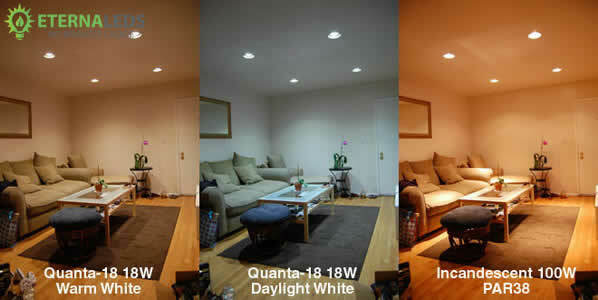 Even if you only save 6 watts per lamp, they’re usually on all night, every night, and come in different colours. • Coloured lights, e.g. holiday lights, car and traffic signal lights, stage lighting etc. can be replaced by LED. LEDs come already coloured in various colours and are often ideal due to their smallness, low energy use and lack of excess heat. Paying for premium quality incandescent light, only to filter out most of through a colored glass, is truly a waste!